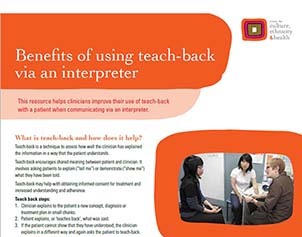 ‘Teach-back’ enables better communication by inviting health practitioners to ask patients, to repeat key information verbally back to the practitioner to ensure mutual understanding and facilitate better care. This resource explains the “teach-back” model, provides case studies for you to follow the process and discusses the benefits to patients and clinicians. This resource will benefit practitioners as it outlines a straightforward method that can simplify a potentially complex situation in day to day practice. To access the resource click here.